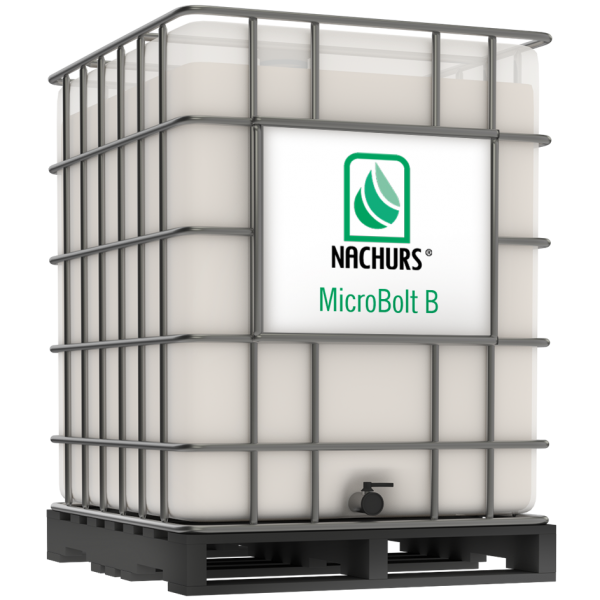 NACHURS MicroBolt B® micronutrients are intended for use in a complete crop nutritional program where a soil and/or plant tissue analysis has indicated a boron deficiency. NACHURS MicroBolt B micronutrients may be applied with NACHURS liquid fertilizers, other liquid fertilizers, fertilizer suspensions, nitrogen solutions, or water. Do NOT apply boron in seed-placed starter fertilizer for corn, soybeans, dry beans, small grains, grasses, cucumbers, and peas. Small grains, peanuts, cotton, canola, flax, soybeans, sugar cane 1-2 pts. 2-5 qts. .50 to 1 gals. Beets, carrots, cucumbers, potatoes, peas, beans, corn, apples, peppers, tomatoes 1-2 pts. 1-2 gals. 1-2 gals. Clover, cherries, citrus, pears, grapes 1-3 pts. 2-3 qts. 1-2 gals. Broccoli, cauliflower, celery, melons, plums, peaches, alfalfa, sugar beets 1-3 pts. 2-4 qts. 1-2 gals. Note: Do NOT apply NACHURS MicroBolt B micronutrients in transplant water. Banded & foliar recommendations are intended to provide starter application of boron for the current year crop and are not expected to correct severe boron deficiencies. Additional banded or foliar applications may be necessary to correct severe deficiencies. Banded generally refers to 2” to the side and 2” below the seed and is usually applied during planting. These are general product recommendations. Please consult with your Circle R agronomist for specific fertility recommendations. NACHURS liquid fertilizer may be used as a carrier at 3-5 gallons per acre. More than one application may be required for severe deficiency. itself provide all the nutrients normally required by agricultural crops. CAUTION: Boron is to be used where soil test and/or tissue analysis indicate a deficiency, and should not be used at rates in excess of the rat e recommended by a qualified individual/entity such as a certified crop advisor, agronomist or university. Excessive application of boron may cause crop damage.